Although the quantity of variable star measurements is not as important as the quality, after studying the great observers past and present, it became obvious to me that to reach 100,000 variable star observations in a lifetime would be quite an accomplishment. There are only a handful of observers who have had the patience, persistence and talent to achieve this in a lifetime. One of these legendary observers stands head and shoulders above the rest, Albert Jones. 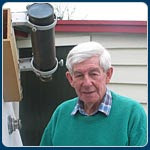 Now 89 years old, this quiet, unassuming New Zealander has made over 500,000 variable star measurements over the last 60 years or so. He has received honors from the Royal Society of New Zealand, the American Association of Variable Star Observers, the Smithsonian Astrophysical Observatory, the Astronomical Society of the Pacific, the British Astronomical Association, the Royal Astronomical Society, and has received an Honorary Doctorate of Science from Victoria University in Wellington, New Zealand. In 1964 he was made one of the first four Fellows of the Royal Astronomical Society of New Zealand, and in 1987 he was awarded an Order of the British Empire (OBE) for his services to astronomy. Minor planet 3152 was named after him in 1988 in recognition of his achievements. If you are involved in variable star astronomy, you know who Albert Jones is. This list of honors and awards does not even begin to tell the whole story. I asked Albert if he would grant an interview, and he kindly accepted. I found Albert Jones, the man, even more inspiring than the legend. During the process, we sent several emails back and forth. In one of the early ones, I misspelled the word “Interview” in the subject line. Albert was far too kind to ever make note of it or correct it, so we sent several more emails back and forth with “Interbiew” in the subject line. For the rest of my life, I will always remember this as 'the Albert Jones Interbiew’. Mike: Let’s start at the beginning. Tell us about your parents and family. Do you have any brothers or sisters? Albert: I was born in 1920 in Christchurch, New Zealand. My mother was such a kind loving person, dedicated to husband and family. Father was a breakfast food miller and head of that department where he worked. There were two brothers and one sister. When my parents went to school, before 1900, only primary education was free. Secondary education had to be paid for, and like most others, it was beyond their means. Around 1930, when I was at school, primary education was free, then one had to pass an exam to gain two years of secondary education, then another exam to go to the next stage. To go further and to be admitted to a university, one had to pass the Matriculation Exam. I did that at the end of 1936, during the depression years, a time during which there was widespread unemployment, and even people with university degrees had to take on menial work, like digging ditches, to earn a living. So I found a job instead of furthering my formal education, but that did not stop me from teaching myself from books. Later on, people urged me to retrain in the hope of finding a better job, but by that time I was so hooked on variable star astronomy that I wondered whether I might not have much time for observing if I did better myself, so I was happy as long as I could carry on observing. Mike: What was it like growing up in New Zealand in the first half of the 20th century? How have things changed since you were a child? Albert: I can still remember when the ‘wireless’ was a novelty and telephones were a luxury, and of course, motor cars (automobiles) as well. Roads were made of shingle (stones) and few roads were sealed with bitumen, many vehicles were horse driven. When I started school, we were taught writing on slates using slate pencils and as we grew older we wrote on paper using pencils and pen and ink. Things we take for granted now, TV, computers and the internet were not even thought about. Mike: How did you first get interested in astronomy? Albert: From an early age I wanted to know about the sky and stars and planets. I do not know how I became so fascinated by them. All I can remember is that my inquiring mind wanted to learn more. Parents and friends helped me with what they knew. After I left school at the age of 16, I was well aware of my limited knowledge and never dreamed that one day I might be able to make a contribution to Astronomy, but for my own fun, and to satisfy my curiosity, I could at least learn the constellations and be able to recognize planets. So with the aid of books, I did that. Then in answer to a request in the newspaper for reports of aurorae, I made detailed notes of the next aurora that I saw, sent it in and was thrilled with the reply stating it was the best report received. So two years later, I timidly asked if there was an astronomy club or society that might accept me as a member. Soon after, I became a member of the New Zealand Astronomical Society (later to become the Royal Astronomical Society New Zealand; RASNZ). Then I started receiving their journal ‘Southern Stars’. Mike: I think every astronomer remembers their first telescope. Tell us about your first telescope. Albert: My first telescope was the crudest thing imaginable. An inexpensive lens kit consisting of what may have been a simple spectacle lens of about 20 inches focus and a small negative lens for the eyepiece. I made a tube for the telescope by wrapping paper around a rod as a pattern, and gluing the layers of paper. Although the images were very poor, it at least allowed me to see things. I can still remember the thrill of seeing the Orion Nebula I had read about in books. Later a bigger lens kit showed me the rings of Saturn. The tube was a cardboard one that had once been the centre of a roll of carpet. A simple tripod made the telescope usable for viewing objects like star clusters and planets, even the rings of Saturn. Then I heard that a local man had an old telescope he was not using, so I bought my first real telescope, a 5-inch f/15 reflector, evidently made for viewing planets and the Moon. The finder was so tiny that it was difficult to find faint star fields away from bright stars. Mike: At some point you decided to start observing variable stars. Tell us about the first variable star you began observing. Mike: Frank Bateson, the founder and long-time director of the Royal Astronomical Society of New Zealand's Variable Star Section played a key role in your interest and development as a variable star observer. Tell us about Frank and your relationship with him over the years. Albert: Yes Mike, the following year Frank Bateson returned from the Navy to civilian life, and in reply to my request to join the Variable Star Section, he sent me charts of 25 variable stars. At first I thought that I had bitten off more than I could chew, but as I gained experience in locating star fields, I soon had the 25 stars on target and asked for more stars. The next batch of 43 stars again made me think I had over-done it, but before long I could locate all those stars. One handicap was the tiny finder. Even now I can remember my frustration one night looking for S Apodis by star-hopping from Gamma Aps, over 3 degrees away! All the intervening stars were too faint to see through the finder. It took me an hour to locate the field. I was determined to find it and did not want to admit defeat. Mike: You also began sweeping for comets early on, and discovered your first comet in 1946. Tell us about your discovery of Comet Jones 1946h. Albert: I did some comet sweeping with the old reflector and successfully recovered Comet P/Kopff, before anyone else, they say. I located it from the ephemeris in the BAA Handbook. Then I heard of a 5-inch refractor that was for sale, and that one was far better to use. The finder objective was larger and enabled me to star-hop to fainter fields with confidence. I also used it for comet sweeping. One morning in August 1946, I had unsuccessfully swept the south-east and found only permanent celestial scenery. I noticed dawn was imminent, so decided to see if I could see U Puppis, as by then the field should be low in the eastern sky. The finder was too high at that position to look through it from standing on the ground, so I hurriedly aimed the main telescope at the region of Puppis using a low power. I swept down to locate the variable, but on the way I noticed a fuzzy object. I made a quick field sketch, but dawn stopped viewing before I could notice any motion. I did not get to see the variable that morning. Rather than make a false ‘discovery’, I waited until next morning. The sky was clouded over, but luckily the clouds moved away in time for me to find the position where the object was the morning before. It had moved away. I kept sweeping until I located the comet. I notified Ivan Thomsen at Carter Observatory who spread the word. That was Comet 1946h. 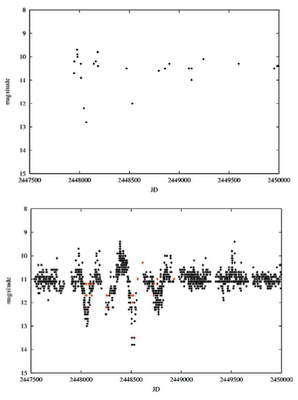 Soon afterward, I realized that variable star observing was not only more fun but also produced real results right away. So I concentrated on variable stars instead. The 5-inch refractor was later replaced by an 8-inch reflector made up from bought optics. Aperture fever later led me to purchase a 12.5-inch f/5 mirror, which I made up into the telescope I still use now. Mike: Your second comet discovery came in 2001, when you were 80 years old. That is quite a long time between discoveries! Not only is that 54 year gap a record, but you are the oldest person to have discovered a comet. What is the story behind your second comet discovery? Albert: In 2000, I learned that Dr. Brian Marsden was stepping down from head of the CBAT (Central Bureau for Astronomical Telegrams) so I wrote to congratulate him on his retirement. In reply, he told me that he was not retiring and was staying on to support Dan Green who had taken on the position. He mentioned that it was a long time since I found a comet and it was time I found another. But that is easier said than done. Mike: The home-built 12.5” telescope you have used since 1948 is named Lesbet. That’s kind of an odd name. Who is it named for? Albert: That is another story. Back in 1947, I wanted an even larger telescope and airmailed to Dr. Les Comrie, a former New Zealander who had revolutionized the British Nautical Almanac Office by replacing math tables with mechanical accounting machines, which he found could be adapted to do mathematical astronomical calculations. Dr. Comrie was very kind to up-and-coming amateurs. I wrote to him and asked where in the UK could I buy a larger f/5 mirror and he replied that his friend James Hargreaves had a mirror blank that he could grind and figure to f/5, then pack it in a box in time for Dr. Comrie to bring to NZ by ship as he had plans to come to NZ to visit his father in late 1947. That suited me fine as it saved me the bother of getting an import license and permission to send money to England, as well as arranging the freight. When Dr. Comrie came to NZ he forwarded the mirror to me, I paid for it by sending the money to Dr. Comrie's account in a large business in Auckland. With the money, Dr. Comrie paid for food parcels to be sent to his friends in England who had not seen luxury food during the war, so everyone benefited besides me. I named the telescope Lesbet after Les and his lovely wife Betty. Les always said she had a perfect figure too! Mike: There was quite a bit of excitement in 1987 when supernova 1987A went off in the Large Magellanic Cloud. You are credited with co-discovering the brightest supernova seen since the 17th century. How did that come about? Albert: I was monitoring some stars not far from the Tarantula Nebula. On that fateful night, while I was observing stars elsewhere in the sky, I noticed some clouds coming over so I poked the telescope at my targets in the LMC. I was quite surprised to see a bright stranger, so I noted its position on the chart. But before I could make a magnitude estimate the clouds moved over. I phoned Bateson who started phoning others for confirmation. Then the clouds moved away and I made an estimate of the stranger before phoning Bateson again to tell him. He then phoned the Observatory at Siding Spring, in Australia, to tell them about the star. I have been told that everyone at the Observatory stopped what they were doing and turned their attention to the supernova. Rob McNaught then checked the photos he had taken and found the star was recorded on them. Rob then phoned Dr. Marsden to say he had a photo of it, but as Brian was already on the phone to Chile, Rob told the secretary. Dr. Marsden then phoned back to Rob to congratulate him on the discovery, but Rob said he was not the discoverer. It was discovered by someone in NZ, but did not know who it was. Dr. Marsden correctly guessed who it might be. Mike: Perhaps your greatest discovery is your wife, Carolyn. How did you two meet, and how has she supported your passion for the stars? Albert: My first marriage was such a disaster that I thought of ending my life. Fortunately, I did not and we parted. I vowed never to marry again, but changed my mind after Carolyn joined the same hiking club. I could not help secretly admiring her. Then when two years later, I found out that she thought the same about me, I changed my mind for the better. Carolyn was such a kind, lovable person and so different that I instinctively could tell she would be the ideal person to live with forever. July 2009 was our 25th wedding anniversary- the happiest years of my life. Mike: How active are you these days? Do you still submit observations? Top curve is AAVSO data without Albert Jones archival observations. Bottom curve is the same time period with Albert Jones observations included in the AAVSO International Database. Albert: I continue to observe variable stars each clear night, and besides sending my observations to AAVSO, I send data on selected stars to over 30 professionals worldwide. I like to start observing as soon as it gets dark, and as I have had lots of birthdays, after observing for 3 hours I become so tired that I have to stop. Then I go to bed and get up again an hour or two before dawn and observe stars that have come up in the east. The thrill of seeing with my own eye how variable stars change has not palled a bit, and to know that what I report is of value to Science is an added bonus. Especially, on a cold winter morning, when I may feel reluctant to leave a warm bed. Once I have put on a few extra layers of clothes and dragged the telescope out of the shed I feel it is so worthwhile. Mike: Even if we knew everything there was to know about variable stars, and therefore no real reason to keep going out night after night to observe them, would you keep observing anyway? Albert: As long as my well-being and eyesight allow me to get to the telescope, there would be a number of stars that I would like to keep monitoring to satisfy my curiosity and for fun. Mike: After discovering two comets, a naked eye supernova and making over half a million variable star observations, what is it that still drives you? What else would you like to accomplish or discover? Albert: Just looking and looking, in case I might discover something, might become boring. So I carry on monitoring stars for Science. And if something new is noticed serendipitously, that would be a bonus. There are lots of my old estimates that were made before reliable comparison star magnitudes became available from sources like the All Sky Automated Survey, so I hope to revise as many as I can while I am still able. Mike: What is the greatest difference between observing and reporting observations now and in the past? Albert: Over 60 years ago there were charts for lots of variable stars, some not as good as those available now, so it is good to obtain better charts and finding charts for them. Long ago, one had to draw finder charts from what one saw through the finder. Now finder charts can be made using PC software and printed by modern computer printers. PCs and software are great for entering the observations from my logbooks, and it is now so easy to sort the individual stars, and select which stars go to whom by email. No longer does it take lots of writing by hand. I could go on and on, but let me just say how lucky observers are today with all this modern technology to take a lot of the drudgery off their hands. Mike: Thank you for taking the time to let us get to know you. Albert: Well Mike, I do hope that I have not bored you with all this. Thinking back over the years, Carolyn and I have enduring memories of the wonderful people who have come into our lives through Astronomy. I sincerely hope that anyone reading this will realize that serious work can be undertaken with only basic gear. If one has access to a modern telescope with all the bells and whistles, please have a go at variable star observing. But do not despair if you do not have such equipment, as so much needs to be done and can be accomplished with very modest gear. I know- been there, done that. The main thing is to have fun. Outstanding interview, in both the human and science dimensions! Thanks Mike for a very interesting interview. Albert Jones is indeed an exceptional person and observer. I remember the article by Bradley Schaefer in Sky & Tel which described Jones' "photometric" eyes. Quite astounding. Mike, I think that Albert is a shining example to us all, if only we could achieve a litle of waht he has, that would be worthwhile. This is a great interview. Many thanks for posting it. I am currently preparing a book for Springer in their Patrick Moore series, and as a sidebar to a discussion of SN1987 and amateur observing of supernovae, I might like to quote from it. But I would want to have your permission first - I would of course cite the blog as the source. So happy I found this interview, Albert and my Dad were longtime friends at the Astronomical Society in Nelson. As a 15 year old I was lucky enough to look through Albert's telescope at the moon around the time of the moon landings as well as other stars and planets, picking up titbits of the observations he was involved in. Albert didn't mention in the interview that he hates the moon as it (light polution) interferes with serious variable star observations. Happy memories. I was also privileged to attend Albert's Hononary Doctorate graduation in 2004. Excellent interview Mike. One of the great observers ever. Albert has been a great friend and mentor for almost 45 years. It is hard imagine what life is going to be like without him around to consult with. I vividly remember the first time I met him. He had 'Lesbet' out in the driveway of his home, and after I introduced myself, he handed me a chart and said "VW Hydri is still bright. Make an estimate." I learned a great deal that evening; not the least that my observing skills needed a lot of work. After I recognised the field stars I could barely even see the variable! The sky was about 80% low cumulus and with the light pollution from Nelson, I was amazed that he could even find the field in such conditions. Apart from all that, he was about the nicest human being I have ever met.